In mid-NovemberPresident VladimirPutin met with U.S.President BarackObama on the sidelinesof the G20summit in TurkishAntalya. Russian President Vladimir Putin and his U.S. counterpart Barack Obama called for de-escalating tensions caused by the crisis in the relations between Saudi Arabia and Iran in a telephone conversation on Jan. 14. "The leaders also called for de-escalating tensions triggered by the crisis in the relations between Saudi Arabia and Iran," the Kremlin press service said in a report. In addition, "they discussed particular aspects of bilateral contacts in various formats, including the military field, aimed to consolidate efforts in the fight against the terrorist threat in the Middle East," the report said. "They also touched upon some other matters of mutual interest. 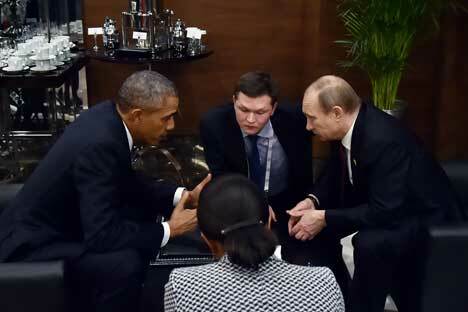 The conversation was frank and businesslike," the Kremlin said.